Product: Silirub WSL+ is a high-quality neutral cure, highly elastic one-component joint sealant based on silicones. It has been developed for weather sealing of expansion joints in the façade industry. • Weatherseal in curtain wall applications. • Ideal for expansion, perimeter, connection and other movement joints between various building materials. • Compatible with double glazed window units. Tooling time Ca. 30 min. • Silirub WSL+ Silicone Sealant is a high-quality neutral cure, highly elastic, one-component joint sealant based on silicones. It has been developed for weather sealing of expansion joints in the façade industry. • Silirub WSL+ Silicone Sealant is compatible with laminated glass. • Silirub WSL+ Silicone Sealant can be used for weather proofing & sealing applications where durability under severe conditions is required. 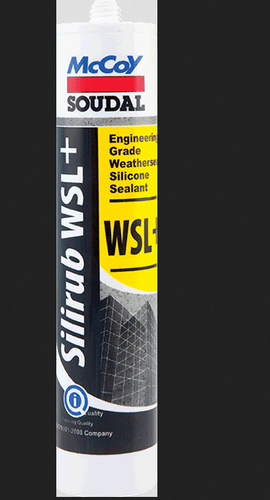 • Silirub WSL+ Silicone Sealant is ideal for expansion, perimeter, connection and other movement joints between various building materials. Compatible with double glazed window units. • Silirub WSL+ Silicone Sealant is compatible with secondary sealants based on polysulfide and silicone in dual-sealed insulating glass units.